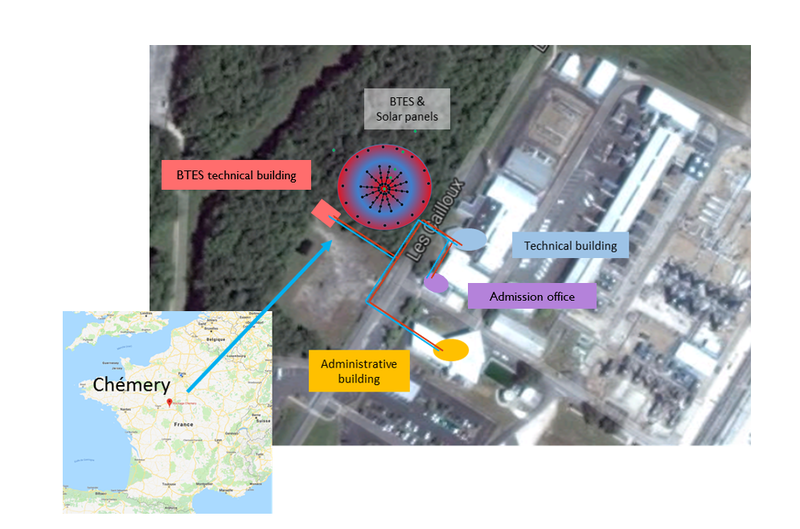 The demonstration project will provide the heating needs for two administrative buildings of Storengy main natural gas storage facility located in Chémery (region Centre – Val de Loire) which represents 211 MWh. These needs will be addressed with 260 m2 of solar panels combined with a BTES charged and discharged through 12 radial lines of 4 boreholes in series. The main objective of this project is to improve the overall efficiency of such coupled systems based on the combination of solar thermal and BTES. Significant reduction of underground heat losses: implementation of specific lateral heat recovery boreholes (16). Subsurface heterogeneities: characterization and impacts in terms of heat losses. Extended monitoring system: 6 dedicated instrumented deeper boreholes in addition to a large number of temperature/rate measurement devices at various points of the surface distribution network. Global efficiency: optimization in real time mode using the whole set of collected monitoring data through a smart system taking account internal and external parameters in order to identify the best choices in terms of rate allocation towards the various components of the combined system. The construction will start in the second half of 2019.